Staff is very helpful: they have organized tours every day to the killing fields and genocide museum, they will help with visas to neighboring counties, and they will help with all your transportation needs. The pool is a necessity in the sweltering heat. 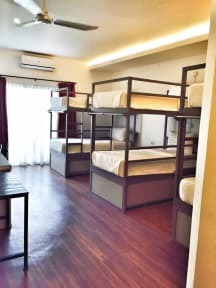 The rooms are clean and air conditioned, and the bathrooms are some of the biggest and best I’ve ever seen at a hostel! Albeit, they are only made for one person at a time (not stalls). Highly recommend! Is was the perfect choice for our trip. The room and bathroom are very clean, the pool is amazing and food is good. It’s a little far from the night market, but that’s not such a big deal, you can easely walk there. Highly recomended! Great place to show up after taking the night bus! The staff will let you sleep in the chairs by the pool until your room is ready. 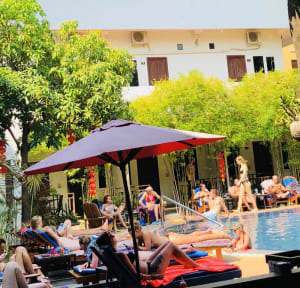 There wasn't much of an atmosphere for meeting people, but it seemed like pretty much everyone at the hostel hangs out around the pool during the day. Great hostel in the center of Phnom Penh. Big, nice pool right by the in-house restaurant and bar. Chill place, although it almost had more of a hotel vibe to it. The dorms were nice. Not too much space though, and we had trouble with our AC as well. Lots of cockroaches in the bathroom, which was off-putting. However, this might have just been bad luck with our particular dorm. Would still recommend this place if you're staying a few nights in Phnom Penh! Relaxed vibe which was nice. The rooms got cold enough to sleep. The bathrooms and beds were clean. Easy walk to pubstreet Long walk to town. I stayed in a private room, which was super spacious and clean. There is a lovely pool and bar to chill at; and the staff are pretty friendly. However I didn’t get much of a vibe here and they don’t lay on any events to help get people to socialise. Having said this, in terms of a base, the facilities are good. Pros: nice pool, good aircon in room, shower good for tall person, good lockers in room, bike rentals available. Cons: multiple staff rude and unhelpful making me feel uneasy during the check in process(no smile, and always telling me to look on internet when asking local questions or just saying they don’t know and moving away rather than trying to help. Room for lugage is left open and not watched so anyone can go into the room. More like a hotel vibe than a hostel vibe. Would not book again.